Suppose you aren’t a job applicant who is merely rather intelligent—a very likely prospect these days, given what is called the “Flynn Effect”, a well-documented historically very recent global increase in average IQ from 100 to 115. Instead, let’s suppose you are very, very intelligent. So smart that you’ve mentioned your Mensa membership in your resume. Was that, in fact, such a smart thing to do? Now suppose you are an equally smart recruiter, although one who has never considered joining Mensa. 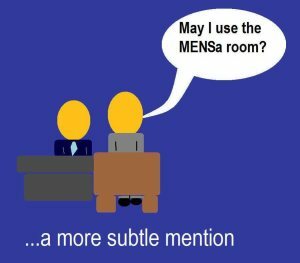 What, if anything, should you make of the resume mention of Mensa membership, which taps the intellectual top 2%—the “what” not being limited to just estimating the applicant’s intellectual horsepower? The debate is also about general attitudes toward intelligence, period—especially very high intelligence, and, as a sidebar, its relationship to wisdom and “success” (which are properly not universally taken to be synonymous). But wait. How intelligent is it to assume there is such a thing as “the American (Canadian/Indian/German) attitude toward intelligence”? In fact, not very—because even within a single culture there are countless attitudes toward intelligence (and everything else), not some single chiseled stone-block attitude. Nonetheless and without getting heavily statistical about this, intelligent anecdotal observation does suggest some cultural themes regarding the proper role of (high) intelligence. Of course, the vulnerability of personal or other anecdotal evidence is precisely that: it’s only anecdotal and casual. Still, perhaps it’s worth a try. In remarking on the role of intelligence in various cultures, it may also be possible to intelligently and insightfully answer the initial main questions about whether or not to mention Mensa membership on a resume or in an interview, or to make much of an applicant’s having mentioned or having it. Competitively displayed intelligence is fine as a finished non-competing “product”, but not as an interactive competitive “process”: Taylor Wilson, the young prodigy who created his own fusion reactor when he was 14 and a “dirty bomb” detector a couple of years later, won awards, scholarships and fame for his efforts. The well-deserved “oooos” and “ahhhhs” have, I suspect, mostly been sincere—but probably because the admirers were not competing with him in that field and in the intellectual dimensions his success measured, e.g., mastery of nuclear physics. On the other hand, science-fair kids who have lost to him probably have felt, at best, ambivalent about his display of prodigious intelligence and cleverness. That said, the question, in the context of the workplace, becomes this: If you are a recruiter or a current employee, are you one of those threatened and competing kids, or one of the unthreatened admirers? If, indeed, you feel threatened, the threat can take various forms: a threat only to your pride or also to your job, if you are a co-worker, rather than a recruiter. Accordingly, it is very likely that an applicant’s mentioning Mensa will not be smart if it triggers a recruiter’s or co-worker’s competitive-process reflex (as opposed to the non-competitive product response). Gaps in intelligence should be either so big that competitive feelings are utterly pointless or too small to not matter much: With respect to the IQ per se and at the purely personal ego-sensitive level, if your own recruiter IQ is at least Mensa level (and institutionally equivalent to the applicant’s or new employee’s) and an applicant (new employee) mentions Mensa membership, it is far less likely that you will respond to it negatively and competitively, than if you know your IQ is at least, say, 10 points lower. Moreover, if in addition to mentioning Mensa, the applicant gets very impressively specific, e.g. “IQ = 220”, the gap between such a score and those of virtually all other humans is so great that it cannot possibly reflect negatively on you or anyone else in the company. So, pure gain for all concerned. Hence, if that is indeed your IQ as an applicant, go ahead and be specific. If you are a recruiter or co-worker, you will probably be less inclined to personally or professionally react negatively if you view the applicant “inclusively”—as a “we” asset or as an “acquisition” that adds value to the job being filled, rather than as a “loose cannon” elitist who sees himself or herself as superior to and apart from the prospective “team”. In this latter instance, the higher the applicant’s IQ, the greater the enhancement of your own in-house prestige, given such “team spirit”. True in professional sports, this applies more broadly, in more ordinary workplaces: Super-stars are fine, so long as you hear them say “we” more than “me”. Companies looking for brilliant soloists, on the other hand, should be unconcerned about this. The recruitment challenge is to test for this sense of “we-ness” and its relevance as an adjunct to the Mensa membership in jobs that require team play and to forget about it in jobs that require stellar solo performance. Merely mentioning being a Mensan is not conclusive proof of either “we-ness” or “me-ness”, since my impression of Mensans is that many are less interested in being superior to everyone else than in being inferior to none. Think of it as a kind of “not last among equals”, rather than “first at all costs” mentality, although the latter will be found in any club, group or population. The germane point here is that not only are high-IQ scorers more or less obliged to modestly minimize the importance of intelligence and test scores, but also that everybody else has a vested interest in doing so, especially those with (much) lower scores. In pragmatic, results-oriented cultures, e.g., North American, such simultaneous hopes to maximize those scores while publicly minimizing them as badges should be no surprise at all. “Results, not scores, count,” American pragmatism and egalitarianism insist. The counter-argument that potential is a great indicator of hoped for results is itself countered with the view that even where a high IQ is necessary, it is never sufficient—neither as a measure of performance nor of the person. IQ scores and clubs are “undemocratic”: Confusing institutional equality, e.g., before the law, with “natural equality”, some egalitarian thinkers, as suggested above, reject any IQ measure or membership they see as artificially or unwisely propping up such natural differences that may exist. In a nation where in theory “anyone can become the President”, there is an egalitarian temptation to fallaciously infer and imagine that also in practice an idealized “Everyman” will or should occupy the Oval Office. Hence the popularity of “Joe the Plumber” (a richly resonating oxymoronic conceptual mix of ordinariness and specialness, which inspires by its use of “the” and its ease of outstanding egalitarian emulation). This perception can easily put a recruiter into a bind: On the one hand, the recruiter’s job is to seek out excellence; on the other, her job is to package it without a tinge of undemocratic elitism. If you are not already in Mensa, think of this foregoing blizzard of opinions as your own personal, mini-IQ test. Time allowed to answer: 3 minutes or your lunch break. Michael Moffa, writer for Recruiter.com, is a former editor and writer with China Daily News, Hong Kong edition and Editor-in-chief, Business Insight Japan Magazine, Tokyo; he has also been a columnist with one of Japan’s national newspapers, The Daily Yomiuri, and a university lecturer (critical thinking and philosophy).